18 kt, yellow gold, high dome, 4.0 mm wide, plain wedding band. The finish on the ring is polished. Other finishes may be selected or specified. Use this calculator on your site. Knowing the size of your finger so the ring will fit correctly is one of the trickiest aspects of buying a ring online. Even if you go to a jewelry store, you can never be too certain if the person behind the counter gets it right. 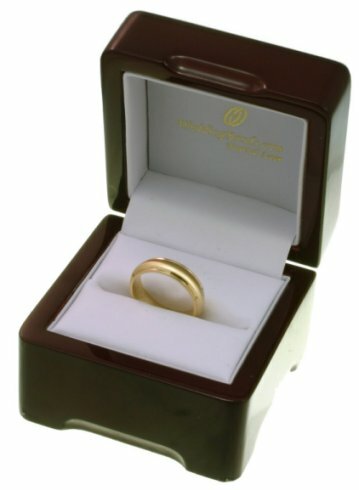 At WeddingBands.com we solved this problem by giving free ring sizing kits that are sent directly to you at no charge. You can size your fingers in the comfort of your own home and see what fits you the best without any doubts. Use the following guide to ensure a perfect fit of your wedding band. When you receive your kit, take the blue plastic kit and punch out the ring sizes you want to try. The ring should go on easily. The ring should feel comfortable on your finger. It should come off with a little resistance. If you think you're between our half sizes, don't fret, we offer quarter sizes on all our rings on WeddingBands.com. Once you know your size, you can order your ring from our site with confidence that your wedding band will fit you perfectly. We guarantee using our sizing kit will ensure an ideal fit from any of our wedding bands. If it doesn't, please feel free to use our 30-Day Return/Exchange policy to find a better fitting ring. Also, if you know your size but it's in a different metric than the standard U.S. ring metric, you can use our ring sizing conversion chart to find out what your U.S. standard ring size is. As always, we are here to help, give us a call at (888) 422-4333 or shoot us an email at CustomerService@WeddingBands.com with any questions or comments. I dont have words to thank you for all youve done for us. I called you in a hurry for wedding bands and you catered for us in a timely manner. Later I needed an upgrade and resizing and you made it happen with no hassle! Im really satisfied with your overall service!!! Thank you!! I ordered wedding rings for my fiance and my self they shipped quickly were securely packaged and fit perfectly. They are beautiful and seem to be great quality. They were also half the price of several jewelry stores. I definitely recommend them. Order was exactly as described big selection fast shipping very competitive price free engraving great return policy although you wont need it. Its the absolute best place for a man to get his wedding band. We offer a free WeddingBands.com Ring Sizer Kit to anyone interested in purchasing from WeddingBands.com. WeddingBands.com offers a Money Back Guarantee if for any reason you are not fully satisfied with your purchase. At Wedding Bands, no purchase is complete until you are 100% satisfied. WeddingBands.com is pleased to offer Free USA Ground Shipping in the United States of America for the purchase of a wedding band from WeddingBands.com. All of WeddingBands.com shipments are insured and require a signature for delivery. We manufacture all our rings by order and do our best to complete all rings and ship within the estimated time frame. Manufacturing time is in business days and do not include weekends or holidays. When your order is completed, you will receive an email with the tracking number and shipping carrier. You can use this tracking number on the shipping carriers website to get the most current status of your purchase. Please select a country's ring size or measurement to find your ring size. Please e-mail us at CustomerService@WeddingBands.com or call us at (888) 422-4333 (USA) or 952-892-1700 (Direct) if you have any questions. Comfort fit means the edges are rounded on the inside of the ring, where it touches the skin. This allows for the ring to slide on easier. With your purchase, WeddingBands.com sends an Appraisal or Certificate of Authenticity to your order. The appraisal gives the exact weight as well as the metal price the day it ships from our facility. Gold: Gold is a precious metal synonymous with jewelry. 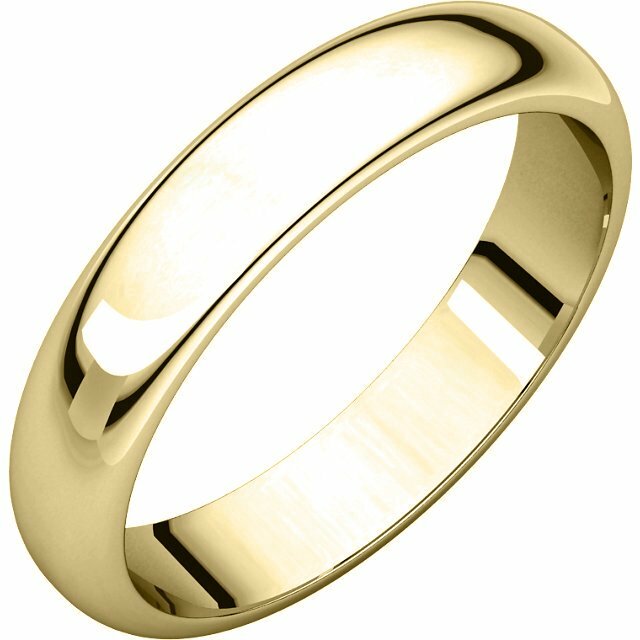 At WeddingBands.com, we only use solid 14kt or 18kt gold in our products. In jewelry, gold remains the most popular precious metal. 14kt vs. 18kt - The karat rating of gold determines how much of the metal is gold versus alloys. Pieces made from 14kt gold have just over 58% gold, while 18kt gold has 75% gold. Gold is mixes with alloys to produce a sturdy product. 24kt gold or pure gold is easy to bend and damage due to the soft nature of gold. Our rings come stamped with a rating of "585" or "14K" for 14kt gold or "750" or "18K" for 18kt gold. Platinum: Platinum is the most expensive precious metal available in jewelry. At WeddingBands.com, we use 950 platinum or 95% Pure platinum, the finest quality available. Platinum does not wear away over time which creates the highest quality jewelry. Inside the ring, we stamp our rings as "950 PLATINUM or "950 PLAT" or "PLAT"". Palladium: Palladium is a fairly new precious metal used in jewelry. It was first used in 1939 in jewelry pieces and has since grown in popularity. 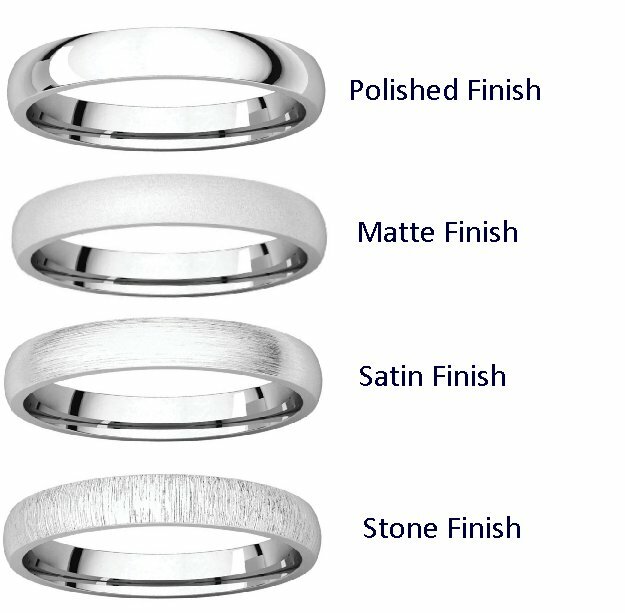 Here at WeddingBands.com, only 950-palladium is used with our jewelry. The rings come stamped with "950 Palladium" on the inside of the ring. Rhodium: Rhodium is used in jewelry typically as a plating material to produce a "mirror-like" shine on white gold pieces. Titanium: A light, but strong material, titanium has gained popularity in jewelry as an alternative option from gold or platinum. *Precious metals - may scratch easily. Refers to the degree to which a diamond is colorless. Diamonds range in color from icy winter whites to warm summer whites. Diamonds are graded on a color scale established by the Gemological Institute of America (GIA) which ranges from D (colorless) to Z. Warmer colored diamonds (K-Z) are particularly desirable when set in yellow gold. Icy winter whites (D-J) look stunning set in white gold or platinum. Diamonds that fall below J will have a faint yellow tint that can be clearly seen. The lower down the diamond color scale the more color will be visible and less expensive. This color is not to be confused with the Z+ category. The Z+ category is for fancy colored diamonds, such as fancy yellow diamonds. Color differences are very subtle and it is very difficult to see the difference between, say, an E and an F. Therefore, colors are graded under controlled lighting conditions and are compared to a master set for accuracy. Truly colorless stones, graded D, treasured for their rarity, are highest on the Diamond Quality Pyramid. Color, however, ultimately comes down to personal taste. At Wedding Bands .com all the diamonds we are using in our Diamond Wedding Rings are at least H in color. Refers to the presence of inclusions in a diamond. Inclusions are natural identifying characteristics such as minerals or fractures, appearing while diamonds are formed in the earth. They may look like tiny crystals, clouds or feathers. To view inclusions, jewelers use a magnifying loupe. This tool allows jewelers to see a diamond at 10x its actual size so that inclusions are easier to see. The position of inclusions can affect the value of a diamond. There are very few flawless diamonds found in nature, thus these diamonds are much more valuable. Inclusions are ranked on a scale of perfection, known as clarity, which was established by the Gemological Institute of America (GIA). The clarity scale, ranging from F (Flawless) to I3 (Included), is based on the visibility of inclusions at a magnification of 10x. Some inclusions can be hidden by a mounting, thus having little effect on the perceived beauty of a diamond. An inclusion in the middle or top of a diamond could impact the dispersion of light, sometimes making the diamond less brilliant. The greater a diamond's clarity, the more brilliant, valuable and rare it is-and the higher it is on the Diamond Quality Pyramid, the more the diamond will cost. At WeddingBands.com all the diamonds that we are using in the Diamond Wedding Bands are at least VS2 in clarity. Refers to the angles and proportions of a diamond. Based on scientific formulas, a well-cut diamond will internally reflect light from one mirror-like facet to another, disperse, and reflect it through the top of the stone. This results in a display of brilliance and fire, thereby placing well-cut diamonds higher on the Diamond Quality Pyramid than deep or shallow-cut diamonds. Diamonds that are cut too deep or too shallow lose or leak light through the side or bottom, resulting in less brilliance and ultimately, value. At Wedding Bands .com the diamonds we use in our Diamond Wedding Rings are all very fine cut to show the maximum brilliancy and fire. Cut also refers to shape-round, square, pear, or heart for example. Since a round diamond is symmetrical and capable of reflecting nearly all the light that enters, it is the most brilliant of all diamond shapes and follows specific proportional guidelines. Ask a jeweler to find out more about these guidelines. Non-round shapes, also known as "fancy shapes," will have their own guidelines to be considered well-cut. An appraisal is a document used to state the current and most updated market value of the jewelry piece. Appraisals are mainly used for insurance purposes. It helps your insurance company know the current value of your jewelry piece to insure it properly. If your jewelry piece is lost, damaged, stolen or any other problems occur; an appraisal helps the insurance company cover the value for replacement. The appraisal will include information such as weight of the jewelry piece, clarity and color of the diamonds, diamond weight, type of metal, colored gemstone identification, gemological laboratory certificate numbers, a picture of the jewelry piece, and any other detailed information about your jewelry. The more detailed the appraisal the better for you and your insurance company to help cover the loss. At WeddingBands.com, we are happy to provide an appraisal for any jewelry piece over $1,000.00USD in value. If your jewelry piece is less than $1,000.00USD and you would still like an appraisal, feel free to request one in the "special instructions" box.